Students have moved in to the 248 bed postgraduate housing project on Holyrood Road. The project of generally six person apartments is arranged around a courtyard at two different levels with a common room adjacent to the courtyard entrance. Access to apartments is by open balconies and two suspended spiral staircases. Most apartments have communal kitchens at significant urban corners and internal circulation is generally daylit and single sided. An upper level terrace is available for all students. Most rooms have the distinctive projecting window bay which we are happy to see is already being colonised by students as a window seats. Photographs have been posted on the project webpage, click here. Our £20m Science Faculty Building at Anglia Ruskin University’s main East Road campus has been submitted for planning permission. 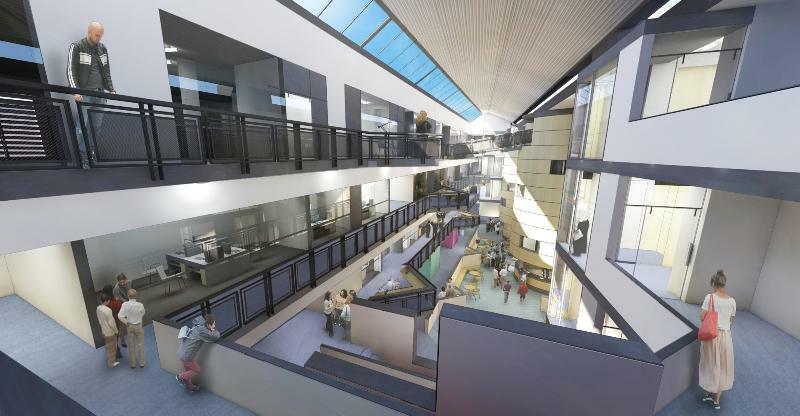 The project provides accommodation for the Departments of Computing and Technology, Psychology, Forensic Science and additional accommodation for Biomedical Science and Animal Science as well as a 300 seat lecture theatre and 200 place “super-laboratory.” The building is designed on a very restricted site and internally is arranged around a top lit atrium, in which is found two towers of psychology testing rooms café etc. Open circulation balconies run past glass fronted teaching and staff rooms. A completion date of summer 2017 is anticipated. A new webpage gives more information, click here. 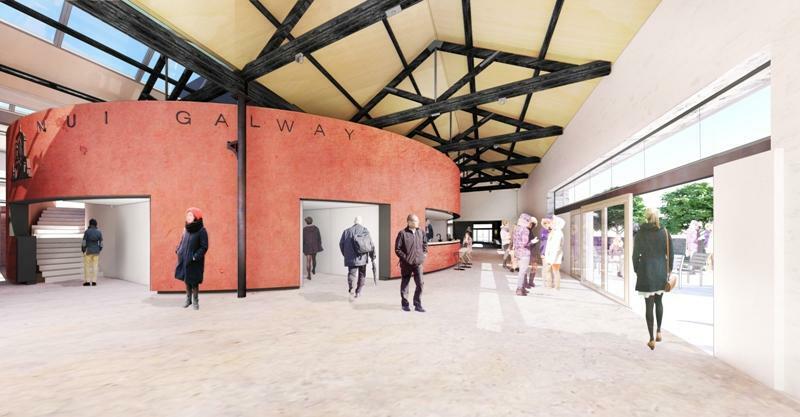 NUI Galway “Centre for Theatre and Performance” a joint project with Taylor Architects of Castlebar has been given planning permission and is now out to tender. A start on site is expected in Spring 2015. St Andrews restaurant for the Royal and Ancient Golf Museum is well underway with the first floor in place and the roof superstructure about to be constructed. 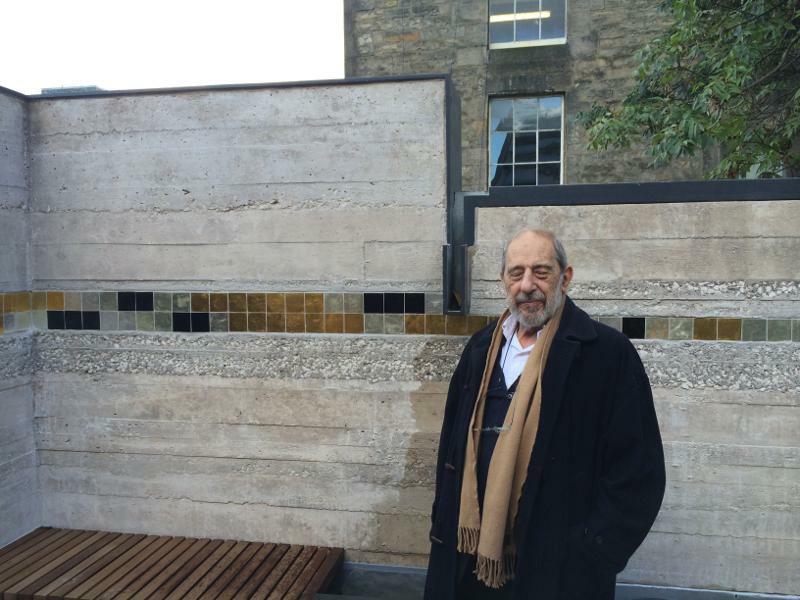 The house for Richard Murphy in Hart Street is almost complete and received a very important visitor in the personage of Professor Alvaro Siza during his recent visit to Edinburgh. Richard moves in at the end of November and the office Christmas dinner will be held there on the 18th December 2014. Anglia Ruskin University Young Street site development phase 2 and 3. This project is well underway with building extensions to phase 1 in two separate but simultaneously constructed directions. Pictured here is the steel work for a 190 seat lecture theatre and other academic accommodation of phase 2 alongside the recently completed building. 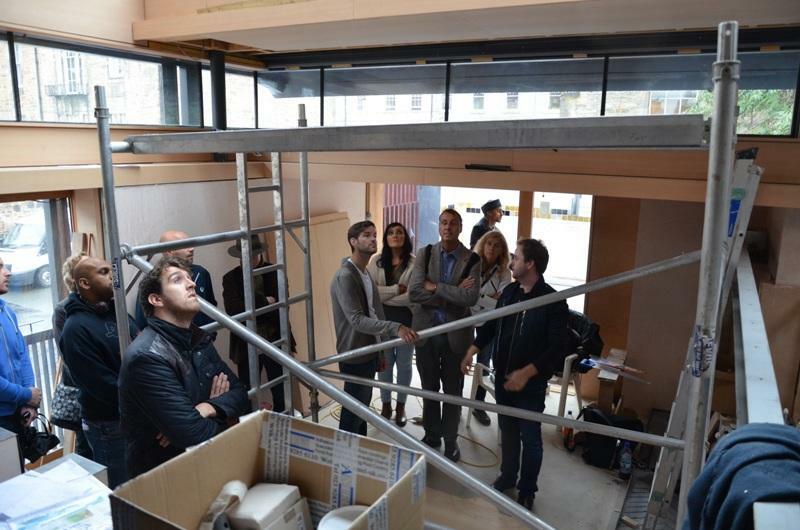 Completion is expected in August 2015 and with it will be the completion of the whole Young Street campus designed by the practice. H.M Raitt have been appointed to constructed a new house in North Berwick and expect to start on site in November. The project is anticipated to take 9 months. Finally the Hockey pavilions at Edinburgh Academy are now on site and the frame should be in place in December. On 26 August, the design magazine, Wallpaper featured our social housing at Wharton Square, Quartermile in Edinburgh. The piece was titled “The architecture projects reshaping Scotland” and emphasised the housing’s layout “….developed to maximise daylight but also create a courtyard, as a social heart to the scheme”. In early September as our new project on the Candleriggs site in Glasgow was announced and public consultations began, it was much in the news. Scottish TV included a video piece on their news on 5 September and also Urban Realm amongst others. In its November issue, “The Scots Magazine” ran an article called “Do It Yourself – What can happen when architects design and build their own homes”. Richard’s recalled his own experience of building two previous houses he has lived in and also his feelings concerning the current building process at Hart Street. Richard was guest speaker at the AJ Retrofit Awardsin London on 17 September and on 18 November he will be speaking at the RIBA at its Research Symposium on the subject of “Designing for Old Age”. Richard will be giving an introduction to the issues of designing for dementia care and how we have been able to produce a successful and inspiring project at Stratheden in Fife. The Royal Scottish Academy Open Exhibitions runs from 29th November to 20thJanuary. We have our smallest project of late on display, namely a recently completed house extension in Ravelston Dykes. The RSA also hosted Professor Alvaro Siza as the 2014 inauguralMetzstein Architecture Discourse. Almost 500 architects, students and others packed the George Square lecture theatre. The Annual Discourse, which was Richard’s initiative, is set up in memory of the late Professor Isi Metzstein. Next year’s discourse on the 14thMay 2015 will be given by the celebrated Australian architect and Pritzker prize winner Glenn Murcutt. Richard is in course of preparing a commemorative booklet for the occasion. Tickets will be on sale from the RSA in the New Year.